While I'm not a big fan of four stroke engines on water ski boats I have to admit that the new Mercury 150 four stroke merits some attention for use on Dyna-Ski 17.6 Open Bows. It is not super charged like the much heavier Verado and there are lots of four stroke fans so this may be the motor for them on their next Dyna-Ski 17.6 Open Bow. In the past four stroke engines on Dyna-Ski 17.6 Open Bows tended to be a little slower out of the hole and a few miles per hour slower than the same size two stroke engine from seat of the pants testing. Given the specifications of this new engine it could very well reduce the difference. The In-Line 4 has 183 cubic inches of displacement and a 1.92 to 1 gear ratio. It weighs in at 455 lbs so it isn't a lot heavier than a 2 stroke 150. 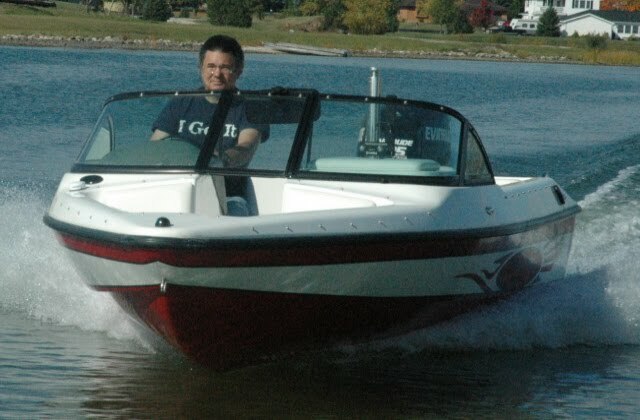 As you know I like outboard motors with more cubic inches and torque for water ski boats. This engine has the cubic inches and should have good torque. Deciding what prop to use on this motor will be the challenge with its excellent gear ratio for water skiing.